The Stradivari Camposelice from 1710, a loan from the Nippon Music Foundation, is in best hands when Svetlin Roussev is playing it. After being rewarded with numerous prizes at many international competition (Indianapolis, Melbourne, Long-Thibaud, he won the 1st prize and two special prizes at the 1st Sendai International Music Competition (Japan).Svetlin Roussev has performed as a soloist in many of the world’s major concert halls in Europe and Asia: Théâtre des Champs-Elysées, Salle Pleyel (Paris), Balais des Beaux-Arts (Brussels), Seoul Arts Center, Suntory Hall (Tokyo), Bolschoi Theatre, Tchaikovsky Concert Hall (Moskau), Konzerthaus (Berlin), under the baton of conductors such as Leon Fleisher, Yehudi Menuhin, Myung-Whun Chung, Emmanuel Krivine. 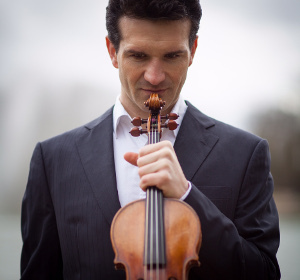 Svetlin Roussev is professor of violin at the CNSMD de Paris, concertmaster of the Orchestre Philharmonique de Radio France and a founding member of the Roussev-Salque-Rozanova Piano trio. He is the artistic director of the Sofia Philharmonic Orchestra.